Since 1994, Jenny has been delivering quality care to our patients. In her role as Clinical Director, Jenny oversees the daily schedule of our clinical team. In addition to her leadership role, Jenny is an Expanded Duties Dental Assistant, certified by the State of Illinois in recognition of her extended study and training in dental assisting. Introducing new patients to our practice and the commitment to excellence we maintain is part of Jenny’s expertise. Her extensive clinical training involves mastery of dental procedures, patient systems and care from children’s dental hygiene to the full scope of adult restorative and cosmetic procedures. 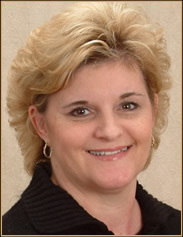 Our patients feel confident that they are in good hands with Jenny’s professional manner and care. A native of Bloomington/Normal, Jenny and her husband, Greg, who works at State Farm, have four children.